Angelika is an individual member of the IBMA, and served as the international representative on IBMA's Board of Directors from 2013-2016. She is a founding board member of the European Bluegrass Music Association EBMA (2001 - 2015), and a forming board member - treasurer (1994-1999) and chairwoman (1999-2004) - of the Swiss Bluegrass Music Association SBMA. In 2005 she co-founded the Bluegrass in Basel association and served as its chairwoman until June 2014. December 2009 through February 2011 Angelika acted as chief editor ad interim of Germany's only bluegrass magazine BLUEGRASS BUEHNE, and stood parent in forming the German Bluegrass Music Association to hand that responsibility back into German territory. February 2011 to December 2015, Angelika was EBMA's chief editor of BLUEGRASS EUROPE, Europe's leading bluegrass magazine. On 13 May 2003, A.R.T. Promotions obtained a Swiss Federal licence to work as an talent agency for artists and musicians worldwide. A.R.T. Promotions is named after my full name: Angelika Regina Torrie. I am a bluegrass music enthousiast and have loved this music ever since I've known it, which is since the late 1980s. I've been involved in activities from 1991, beginning as a fiddle player in a band called Down Yonder and then the Bluegrass Hoppers. In 1993, I was with a group of people who started preparing for a bluegrass organisation in Switzerland, and on June 3, 1994, the Swiss Bluegrass Music Association was formed. Responsible for finance and accounting, I was one of seven forming board members. From October 1999 - September 2004 I was the chairwoman of the board of this organisation, which was built up with much effort and hard work and has considerably contributed to raise the image of bluegrass music both in Switzerland and Europe. When my second child was born, I stepped down from all responsibility within the SBMA. Through the activity, I met innumerous bluegrass interested people and worked closely together with Paolo Dettwiler. Thus, I also became involved in the European Bluegrass Network EBN since its very beginnings in Basel Switzerland, in 1995. My task was to act as the representative for the Swiss bluegrass community in the network, and to type the first two editions of the European Bluegrass Directory. The network developed further and I became a co-founder of the European Bluegrass Music Association EBMA, founded on 4th February 2001, and have since been its treasurer, and in addition its chairwoman from 2009-2012. The network created by these activities led to my filling a gap at that time in Europe, and in 1998 A.R.T. Promotions was registered with the intention to slowly start a small business for bluegrass music in Europe. 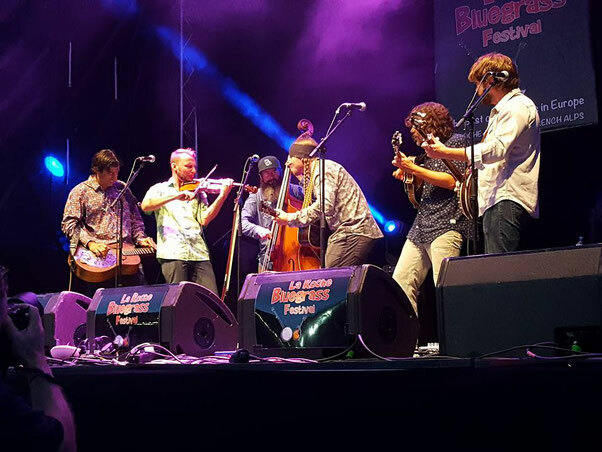 The idea was to organise two or three European tours for non-European bands, raising the recognition of and interest into bluegrass music in Europe. In the not too distant future, this should then finally enable promoters to book talented European bands for their venues without having to fear a loss of money because the audience only wants to pay good money for hearing US bands. Until May 2009, 44 tours of various US bands were organised or co-organised by A.R.T. Promotions, and some Swiss and European bands were booked through my office. Interviews with European bands and artists have been published in the BLUEGRASS EUROPE magazine (which in 2001 became the official newsletter of the European Bluegrass Music Association) and, last but not least, a network of promoters who help create the image of bluegrass music in Europe, has evolved from these activities. In 2011, the touring business was put aside for family reasons but Angelika continues to give advice and coaching to determined bands to let them organise their own European tours. This has become much easier with the available network and the internet at our service. Finally, in 2015, I took to studying culture management at Basel University, taking her degree in fall of 2018.